How do you know you might have sleep apnea, and; what are the symptoms for sleep apnea? Then again, what the heck is sleep apnea? Obstructive Sleep Apnea (OSA) which is also known as obstructive sleep apnea syndrome is when airflow to the lungs is blocked because the tongue or soft tissues of the throat or soft palate collapse onto the back wall of the upper airway thereby creating the obstruction. This obstruction could be a partial obstruction (snoring) or it can be completely blocked, which is then known as OSA. 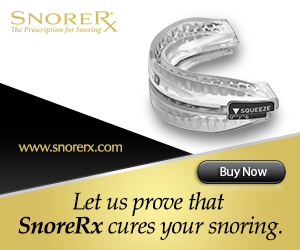 So sleep apnea is basically; snoring extreme or an extreme form of snoring. There are actually three types of sleep apnea, which you can read up on if you want, in my article; What is Sleep Apnea. Ok back to my first question of how do you know if you might have sleep apnea? Well this is not a straight forward answer, and you DO need your bed partner to help you a bit. You see, one of the major signs of sleep apnea is when you stop breathing several times during sleep because of the obstruction in your airways, and then your brain has to ‘reactivate’ your breathing, usually with a loud snort or gasp for air. This can obviously only be observed by your bed partner while you sleep, unless you record yourself of course. If they notice that you frequently stop breathing during sleep or while you snore, and then have to gasp or almost choke to get air, chances are you could have obstructive sleep apnea. Another thing to take note of is if you are constantly tired during the day. Daytime sleepiness is one of the major signs that you might have sleep apnea. If you seem to fall asleep doing normal daily activities, like working, eating and driving, you need to get to a doctor as soon as possible. Falling asleep during boring staff meetings does not count! People have been known to fall asleep while driving to work or back, and it is something to be taken very seriously. Watch the video below and you will see how serious it can be. Other symptoms could be extremely loud snoring, if you snore more than 3 times a week, or even if you have a large neck. High blood pressure is also a sign of OSA, so take care of this and see a doctor if in doubt. Changes in mood or behaviour. You should however also note that some of these symptoms are not only relevant to sleep apnea, and could be indicating something different. That is where personal observation from you partner will help, because if you have some of these symptoms and you stop breathing while sleeping, then you have multiple issues pointing to possible OSA. Sleep apnea is very serious, and any warning signs should be taken seriously. See your doctor immediately if you suspect you might have sleep apnea, don’t take chances with your health. You will probably have to undergo a sleep study before a final diagnosis will be made. A home sleep study is an option for you and a good option at that, because it is much cheaper to do. Knowing the symptoms for sleep apnea and therefore knowing whether you could have OSA can potentially save your life, so I hope this information was beneficial to you. Comments are welcomed as always, so please let me hear from you. This is some great information, and I appreciate your point that constant tiredness throughout the day could be a sign of sleep apnea. My husband has been complaining of being exhausted all the time, but he’s been getting plenty of sleep. I’ll definitely pay attention to see if there are breaks in his breathing during the night, and we’ll talk to his doctor about sleep apnea. Thanks for the great post! Yes it would be a great idea to watch him at night and look out for breathing changes. You might lose a bit of sleep, but keep your husband healthy in the process. Thanks also for the kind words, I hope to hear from you again.